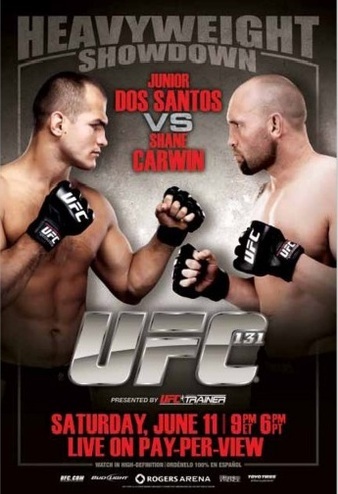 UFC 131 Shane Carwin vs Junior Dos Santos | MMA Fighting Events Videos Techniques UFC Fight Picks and News. This Saturday June 11, the UFC returns to Canada with UFC 131 Shane Carwin vs. Junior Dos Santos. UFC 131 takes place at Rogers Arena in Vancouver, British Columbia. While Brock Lesnar had to drop out of the main event fight with Junior Dos Santos, the UFC did a great job making this a watchable main event by inserting Shane Carwin. Don't blink MMA (Mixed Martial Arts) fans because someone is going to get knocked out! The main event at UFC 131 isn't a title fight, but the rest of the card makes up for it. There are some interesting match ups in this one. Kenny Florian makes his debut at Featherweight (145 lbs) and looks to lock down the division with his razor sharp Muay Thai elbows and great Jiu Jitsu as he faces Diego Nunes who only has one loss. Demian Maia is going to try to use his excellent MMA Jiu Jitsu skills to beat a strong wrestler, hard puncher and all around tough guy in Mark Munoz. The rest of the card is rounded off with some MMA vets trying make a final run at a UFC title and some young fighters hungry to rise through the MMA and UFC ranks! The UFC is making a strong push to showcase MMA to the casual fan by showing the prelims on Spike TV as well as four fights that will be available on the UFC Facebook Page and Youtube. If you haven't seen the UFC 131 Countdown show, check out the full video. As always the UFC does an awesome job putting these videos together. If you're not pumped up for UFC 131 yet, this video will definitely get you ready for some chingasos and Chingajitsu! If you're interested in training in MMA (Mixed Martial Arts) and you're in the Los Angeles area, make sure to take a look at our Los Angeles MMA Gym and School Directory.